The contents of this packet are great for hands-on review of EA words (short and long e). 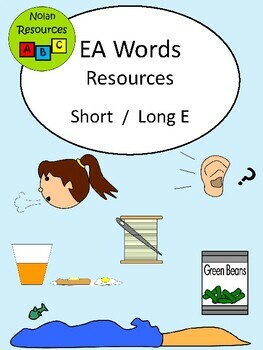 Use to help introduce young students to the short and long e sounds of EA words. Or use to help your older elementary students review this vowel pair. Start your students off by sorting the Picture-Word Cards. 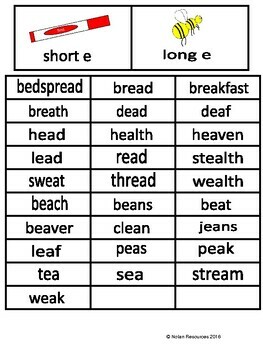 These include 15 short e words and 13 long e words. Pictures and words are included on these to help cement the word in the student’s mind. Once students have had practice with these words, move them on to the Word Cards. The same words as above, but no pictures. 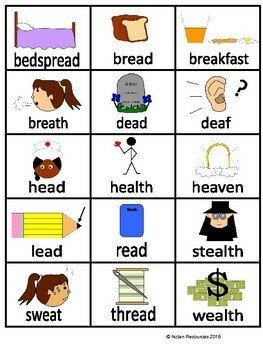 See if the students have mastered sounding out the words without the help of pictures. 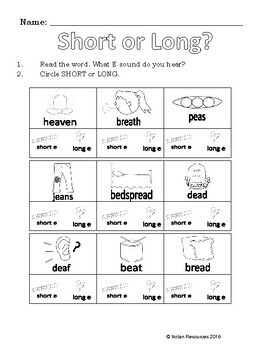 5 Worksheets are included to help the student learn the words before sorting the Word Cards (without pictures). Worksheets included contain color and black-and-white versions!